Cannabis should be available on prescription to stop people who use it to ease pain being criminalised, AMs argued in a Senedd debate on Wednesday. In a vote a majority of assembly members backed calls for cannabis for medicinal uses to be legalised. AMs were concerned that some living with conditions such as multiple sclerosis (MS) using cannabis are putting them at risk of prosecution. But the UK government said it had no plans to legalise the Class B drug. The Home Office said there is clear scientific and medical evidence that it is harmful. Do lower drug penalties help cut habit? Could Portugal's approach work in Wales? 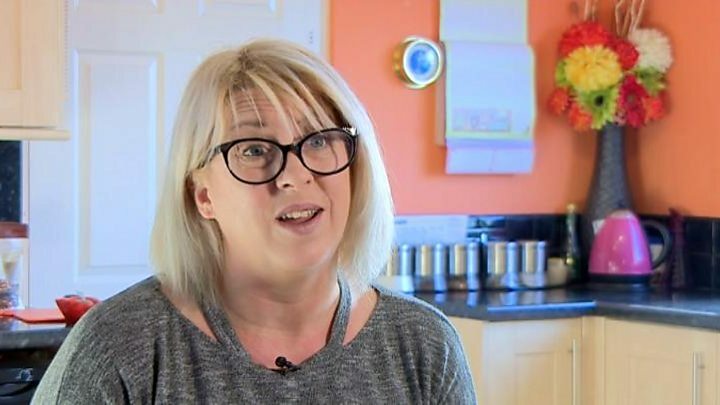 Rhian Cowen, 46, from Pembroke Dock, has MS and said she could not understand the problem with prescribing medical marijuana. While she does not use illegally obtained cannabis, she uses products which contain CBD - a non-psychoactive substance found in cannabis - which are not currently licensed for medical use in the UK, but are sold online as supplements. "While I was going through the process of being diagnosed I stopped taking it, so that the symptoms would re-emerge. I had awful tremors, migraines... all the time," she said. "It works right across the board in making you feel better," she added. Welsh Conservative AM Mark Isherwood, Labour AM Mike Hedges, and Plaid AMs Ms Wood and Rhun ap Iorwerth triggered the debate on Wednesday, arguing there is "clinical evidence of the effectiveness of cannabis for medicinal purposes". In the vote 31 AMs backed calls for the Welsh Government to lobby their UK counterparts to reschedule the drug for medical use. 2 voted against and 18 abstained, including the Welsh Government. The vote is non-binding, but can be seen as an expression of the assembly's view. Mr Isherwood said: "We have met constituents living with a range of conditions, including multiple sclerosis, epilepsy, dystonia and cancer, who find the benefit of using cannabis for medicinal purposes but by doing so they run the risk of prosecution." There is one cannabis-based drug available on the Welsh NHS for MS sufferers - called Sativex - but the MS Society has said that access to the drug has been patchy. Mr Hedges, Labour AM for Swansea East, said: "We shouldn't interfere with doctors' ability to prescribe". Ms Wood added: "The clinical and anecdotal evidence of the effectiveness of cannabis for medicinal use is compelling." Health Secretary Vaughan Gething accepted that there is "some evidence that cannabis or its derivatives can have a role to play in managing chronic pain, anxiety, spasticity, and nausea and vomiting in the context of chemotherapy". But he said the AM's proposal would advocate the use of herbal cannabis and circumvent long established regulation processes for drugs. "If you... make a raw form of the drug available, or a herbal form, then can't know the potency of that," Mr Gething said, later adding: "Just because states in the United States of American do this, it doesn't mean we should follow." Tory AM Darren Millar said he was not opposed to cannabis-derived drugs but said raw cannabis "could and would be abused and be dangerous in our society in Wales". The matter is not devolved and is therefore not in the control of the Welsh Assembly or Welsh Government, with the Medicines and Healthcare Products Regulatory Agency responsible for medicines regulation. A Home Office spokeswoman said: "We recognise that people with chronic pain and debilitating illnesses are looking to alleviate their symptoms. "However, it is important that medicines are thoroughly tested to ensure they meet rigorous standards before being placed on the market, so that doctors and patients are assured of their efficacy, quality and safety. "Cannabis is a controlled class B drug, as there is clear scientific and medical evidence that it is a harmful drug, which can damage people's mental and physical health, as well as harming individuals and communities." Newport West MP Paul Flynn has proposed a bill legalising cannabis for medicinal purposes in Parliament. A Welsh Government spokeswoman said: "We made Sativex available in Wales because it went through a highly-regulated quality assurance process." Could Portugal's radical drug approach work in Wales?